Welcome to the Full Body Photo Project! Be sure to like my facebook page to stay up to date on the next Join & Win campaign! What's next? 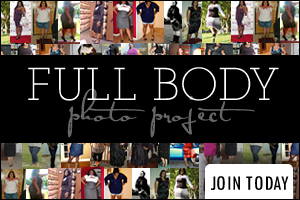 Stay in the conversation and empower your fellow ladies by uploading your daily full body photos to Instagram and tag #fullbodyphotoproject, I will feature readers every month on my blog here! Last year we had over 30 winners and gave out over $5,000 in prizes! Stay tuned for the 2012 Join & Win Campaign! These are NOT the prizes for 2012, just an example of what we did last year. Stay tuned by ENTERING TO WIN to be first in line for our next sweepstakes!